The oceans in the world are littered with vast amounts of plastic waste. At present, a new technique has been developed by a PhD organic chemist and a sailboat captain to enable the recycling of specific plastics, converting the useless wastes into a priceless diesel fuel by means of a small mobile reactor. The researchers propose that the technique can be implemented worldwide in the near future on land as well as probably be positioned on boats to transform waste plastic in the oceans into fuel that can power the vessels. The outcomes of the research were recently presented by the researchers at the 253rd National Meeting & Exposition of the American Chemical Society (ACS), which will until April 6 2017 by ACS, the world’s largest scientific society. The meeting features over 14,000 presentations on a broad array of scientific subjects. His colleague, Swaminathan Ramesh, PhD, was prompted by the wish and enthusiasm of searching for an innovative “killer idea” that can completely transform the world. After working as a research chemist in BASF for 23 years, Ramesh took an early retirement in the year 2005 and started hunting for new chances. Subsequently, he established EcoFuel Technologies and combined his chemical expertise with Holm’s worries on oceanic pollution and plastic trash. Meanwhile, Holm established a nonprofit organization called Clean Oceans International. 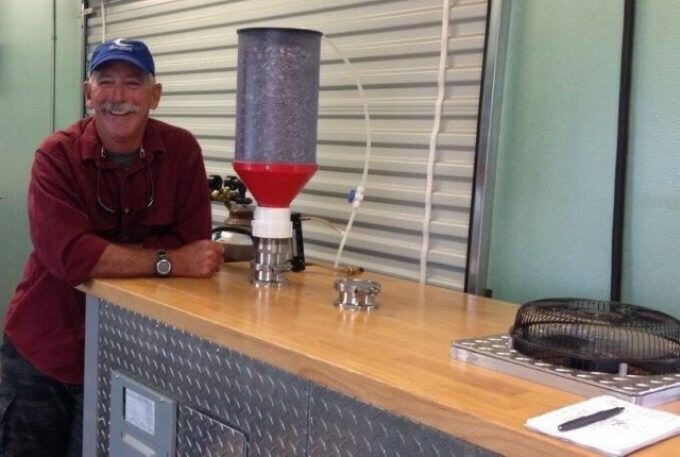 Together they attempted to invent a technique for reusing waste hydrocarbon-based plastics as a feedstock for producing priceless diesel fuel. They aimed to clear the plastic waste from the world by developing a market for it. According to Ramesh, for many years, pyrolysis methods have been adopted for depolymerizing or breaking down unwanted polymers, for example plastic wastes, thereby producing a hydrocarbon-based fuel. However, the method normally involves expensive and complex refining steps to render the fuel usable. Ramesh worked to resolve this and created a metallocene catalyst that can be deposited on a porous support material which when combined with a controlled pyrolysis reaction directly produces diesel fuels without the need for additional refining. When performed on a small-scale, the process runs at lower temperatures, is cost-efficient, and is mobile. The catalyst system also allows us to perform the pyrolysis as a continuous-feed process and shrink the footprint of the whole system. We can scale the capacity to handle anywhere from 200 pounds per 10-hour day to 10,000 or more pounds per 10-hour day. Because of its small size, we also can take the technological process to where the plastic wastes are. According to Holm, the entire system can be installed at the back of a flat-bed truck or within a 20-foot shipping container. According to the researchers, the following step would be to demonstrate that the technique holds good and that it can produce drop-in diesel fuel that is usable. Very soon they will organize a demonstration project for the Santa Cruz city government in California. Holm added that the Santa Cruz city government officials are fascinated about executing the technique to dispose of waste plastics that cannot be reused at present, and also to produce diesel fuel that can be used for the vehicles in the city. The project was supported through private funding. The reactor and the catalyst system were developed through self-funding from Ramesh and his establishment EcoFuel Technologies. I agree wholeheartedly with ambitions of Ramesh and Holm to clean up the oceans. A little while ago I submitted my suggestions to the Offshore Drilling sector of the Oil Industry on a feasible idea to re-deploy redundant semi-submersible and floating rigs to skim the Gyres (some as big as Texas) that are contaminating our oceans. With the Holm Ramesh idea for converting plastic waste to usable fuel I believe this case might be even more affordable and attractive. Please let me know how I can contribute further.